More about my second great grand aunt, Anna Claudine Freeland. 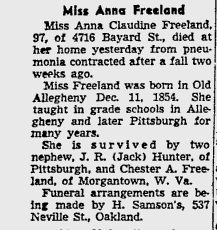 Miss Anna Claudine Freeland, 97, of 4716 Bayard St. [Pittsburgh], died at her home yesterday [June 14, 1952] from pneumonia contracted after a fall two weeks ago. Miss Freeland was born in Old Allegheny Dec. 11, 1854. She taught in grade schools in Allegheny and later Pittsburgh for many years. She is survived by two nephew, J. R. (Jack) Hunter, of Pittsburgh, and Chester A. Freeland [sic] of Morgantown, W. Va.
Funeral arrangements are being made by H. Samson's, 537 Neville St., Oakland. Those who were of "Old Allegheny" were very proud of it and always made mention of it. The two nephews listed are sons of her sister, Mary (Freeland) Hunter, her only sibling to have children. Mary and her husband James Hunter were parents to ten children, so "Aunt Claude" outlived eight of those ten nephews and nieces, including my great-grandfather, Percy Earle Hunter, who died in 1935. Nephew Jack Hunter lived to be 102, dying in 1984. What is not mentioned is that she was also survived by several great nephews and great nieces, my grandmother and her sisters included, and great-great nephews and great-great nieces, including my mother and her sisters. Although I don't know the exact date, it was this spring of 1952 that my mother graduated from high school.